CANNON BALL, N.D. -- Wearing a traditional Native American shirt, Boston Celtics star Kyrie Irving was welcomed into the Standing Rock Sioux tribe on Thursday and given the Lakota name Little Mountain. Joined by his sister, Asia, Irving stood on a buffalo skin as a tribe elder, Vernon Iron Horse, prayed. He followed a variety of traditions before a beaded medallion was placed over his head as he learned his Lakota name. His sister was given the name Buffalo Woman. The ceremony took place in Cannon Ball. Elizabeth Larson, Irving's mother, was part of the Standing Rock Sioux at birth but was adopted as a small child. She died when Irving was 4, but on his own, he has learned more about his Native American heritage. Are they planning to have this again? Timberwolves meeting with Disgruntled Jimmie Butler today. Will he be headed to Philly for Saric and another player, NJ, NY, Denver or Lala Land? So Butler pisses off Thibs, changes the meeting from Minnesota to LA. Gil Dobie wrote: Timberwolves meeting with Disgruntled Jimmie Butler today. Will he be headed to Philly for Saric and another player, NJ, NY, Denver or Lala Land? I could live with him here, assuming he's healthy. He's almost 30, and Dario is something like 5 years younger than Butler. Jimmy's transformation from grinder to diva is almost complete. Thibs should give him a Snickers bar. Latest rumor is Butler for Kuzma or Hart, and Caldwell-Pope. Dumpster fire continues to burn in Minnesota. Thibs doesn't want to trade Jimmie Buckets, Towns won't sign if Buckets is on the team. What a shifshow. Gil Dobie wrote: Dumpster fire continues to burn in Minnesota. Thibs doesn't want to trade Jimmie Buckets, Towns won't sign if Buckets is on the team. What a shifshow. Easy call, keep KAT and trade Buckets. The original trade isn't looking as bad from the Bulls perspective. Looks like Wiggins is also relieved Butler wants out. His brother Nick tweeted "Hallelujah", after Butler's request went public. If Thibs gets fired, there's a possibility of the first Female NBA Coach, Cheryl Reeve of the Minnesota Lynx. 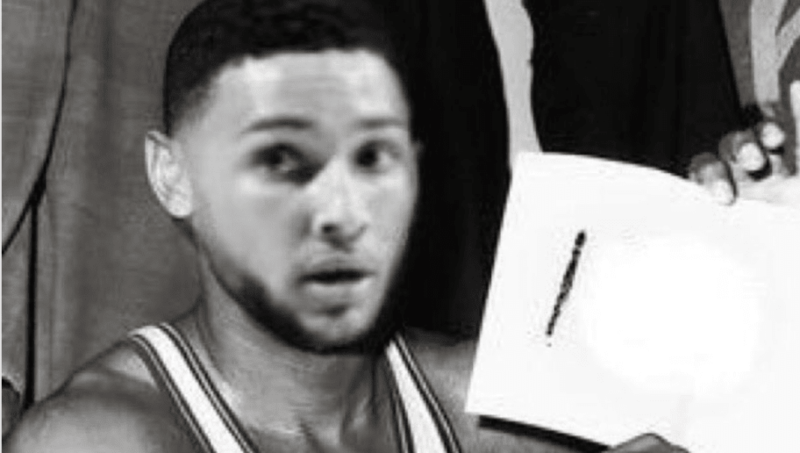 Word is the T-Wolves were asking for Ben Simmons in a trade with the Sixers. Shockingly, there are no more trade rumors with the Sixers. GannonFan wrote: Word is the T-Wolves were asking for Ben Simmons in a trade with the Sixers. Shockingly, there are no more trade rumors with the Sixers. Yep, they pretty much shut Philly up. So now the T-Wolves fans are bailing as well and looking for other teams? Maybe Thibs can include some fans in the upcoming Butler trade. Butler most likely goes to Miami if he does go anywhere. Not sure I'm totally on board with giving up Abedayo and JRich and a pick for him since we most likely wont be able to offer him the max with our cap situation. DSUrocks07 wrote: Butler most likely goes to Miami if he does go anywhere. Not sure I'm totally on board with giving up Abedayo and JRich and a pick for him since we most likely wont be able to offer him the max with our cap situation.
" I don't know if it's Markelle Fultz or Stevie Wonder, he can't see anything"
Gil Dobie wrote: " I don't know if it's Markelle Fultz or Stevie Wonder, he can't see anything"
Yeah, crappy opener for the Sixers, but it was expected. They're a work in progress and we'll have to measure it in the playoffs. Simmons looks great again, Embiid (once he stops dribbling the ball off his legs) looks maybe better, but then the group around them is a big question mark. I'm not of the group that is worried about replacing Ilyasova and Bellinilli (sp) - the former is replaced by Chandler and the latter couldn't play a lick of defense. Saric was in foul trouble all game so he didn't play, and Chandler and Muscala being hurt and not playing kept the bench short. Fultz wasn't terrible in his first game, as he can play defense (he was on Kyrie a lot and gave him trouble), but he'll need to round into an offensive player if he's going to avoid the bust label which is starting to solidify around him. Reddick won't always shoot that badly, although I expect Covington to indeed shoot like that. Chandler is the guy who hopefully will fill a role they need and give them some presence down low so that Embiid doesn't need to do all of the work defensively. We'll see what they look like once he's playing actual minutes. A good win against the Bulls tonight would get rid of the bad taste from Tuesday. 89Hen wrote: When does the NBA season start?